without loss of manly vigor . . .
and the manly virtues of our souls. "An excellent tool for any setting where the users need to develop exercise programs." "A must set of tools for the personal trainer wanting to be a full service provider." "PC-Kits has improved client satisfaction by helping me educate them on how to exercise safely." "I love having a visual presentation of my clients’ workout history. It's so easy to see what I have done and where I need to go next." Susan Gilmore, Personal Trainer/President, Personal Best Inc.
"No other program we previewed generated the accuracy and quality of handouts we get with PC-Kits. It has enhanced our professional status with our clientele." "I use VHI products to help my clients exercise properly when I can't be there. These tools are wonderful!" "Get a competitive edge by providing clients with the highest quality professional information. We recommend VHI products to all of our personal trainer students." "Everyone loves it. It's just wonderful!" "This program is just incredible." "Of all the programs we previewed, not one came close to the quality." "We love what this program can do." "I've used other computerized exercise programs, but this is the best by far. It's easy to use, and the database is incredible." "We have used WebExercises® in our practice for six months. In the past, we have implemented other exercise delivery programs and eventually lost enthusiasm and stopped using them. I have found just the opposite with WebExercises®; the more I use it the more I love it! My patients love it, too!" "WebExercises® has been an invaluable tool for our clinic. Doctors and patients alike have marveled at how easy it is to use, how clear the instructions are, and how complete the exercise database is. Thanks for creating such a terrific program!" Your Weight Wellness Plan™ is your map for the journey and your Positive Personal Trainer™ is your driver who knows the terrain and helps you reach your destination – providing information, inspiration, motivation, structure, consistency, positive accountability, feedback, and encouragement to help you reach your goals. If you live in or near the Santa Fe area we can do private training in-home or at a health club, fitness center, or gym such as Santa Fe Spa. If you don’t have a home gym, I can design and equip one for you. I’ve designed several home gyms as well as the Zia Vista and Nava Ade gyms. I can help you with your strength workouts while you do your aerobic workouts on your own, or I can help you with both. For optimal testosterone-to-cortisol ratios, benefit-to-cost ratios, and long-term sustainability, 30-minute strength training workouts are optimal: they should be intense but short. Aerobic cross-training workouts can be longer. After gradually working up to it, aerobic workouts can be 90-minutes or even longer. After building a strong base with conventional long slow distance (LSD) aerobics you can optimize the benefit-to-cost ratio of your training by advancing to interval training. Interval training is more intense and briefer as well as much more effective than traditional LSD training which was popular in the 1960s and 1970s, up to 9 to 20 times more effective and time efficient. Strength training Santa Fe Style: The Holistic SETs System™ exercises whole motor systems (synergistic muscle & bone groups) with compound multi-joint exercises through the planes of motion that have shaped the human body for some 8 million years of hominin evolution, in contrast to the old-school reductionistic approach popular in the 1970s that broke the body down into smallest units, exercising individual muscles with isolation exercises out of their evolutionary systemic context. We now know that only the large compound multi-joint exercises elicit significant endocrine responses to exercise due to their systemic nature – these are the exercises pro athletes use because they work. Reductionistic isolation exercises can be useful in therapeutic settings, but they are not systemic in nature. We also know that natural compound multi-joint ‘closed-chain’ exercises, like the squat, are safer than unnatural isolation exercises such as leg extensions notwithstanding well-intentioned recommendations from conventional physicians venturing outside their disease expertise despite fundamental ignorance of biomechanics, exercise physiology, and fitness training. These ‘medical’ recommendations have damaged many knees. Compound exercises also address imbalances as the weakest link in each motor system is naturally strengthened more to bring it into balance with the other links in the chain. Compound exercises also enjoy more carry-over application to everyday activities as they’re closer to how we use the body in the real world: we don’t find pre-balanced rotary resistance anywhere outside of gyms. Yet all objects pushed, pulled, or lifted in the real world have mass and weight from gravity and have to be balanced. Compound exercises with free weights thereby also build the most neglected components of fitness: balance, coordination, and agility which is why they help us lift objects in the real world. Strength training workouts are 30-minutes and aerobic workouts are anywhere from 15-minutes to 90-minutes, depending on what you need and where you’re starting. Training packages include any combination of strength and cardio workouts. Even though aerobic workouts are longer than strength workouts, I charge the same price for both to keep them interchangeable and because I benefit from doing cardio with you. Beyond aerobics is interval training which is more effective, but you need a good foundation of relatively low intensity low impact aerobics before advancing to interval training. When you are ready to take your cardio to the next level I can help you implement an interval training program which can be from 9 to 20 times more effective than traditional long slow distance (LSD) training. With 24-hours notice you have unlimited freeze privileges and there is no time limit or deadline for using your workouts, they can be used anytime. We will work around your travel schedule. All-in-One fitness projects 3-months or longer are guaranteed. How long does it usually take to see results? It varies, but usually 3-4 weeks, sometimes sooner. Typically other people will notice before you do, or your clothes will start feeling looser before you've noticed any difference. The reason is that we see ourselves every day in the mirror and don't notice daily incremental changes. But when you see someone who hasn't seen you in a while they tend to notice and may comment. I’ll give you easy ways to measure your progress. What my clients usually notice first is increased energy and sounder sleep: they start feeling better before they start looking better. And they often tell me they like feeling better even more than looking better – that looking better is icing on the cake confirming how much better they feel! Below: Santa Fe Personal Trainer Jeff Nailen showing Laura proper form at Santa Fe Spa. 1.Kraemer, WJ. Exercise Physiology: Integrating Theory and Application. Lippincott Williams & Wilkins. 2011. 2.Fischer DV, Bryant J. J Am Coll Health. 2008 Jan-Feb;56(4):369-76. 3.Ratamess NA, Faigenbaum AD, Hoffman JR, Kang J. J Strength Cond Res. 2008 Jan;22(1):103-11. Thomas Jefferson, Letter to Thomas M. Randolph, Jr.
and save up to $719 on your personal ‘Go Green from the Inside-Out’ health & fitness project. 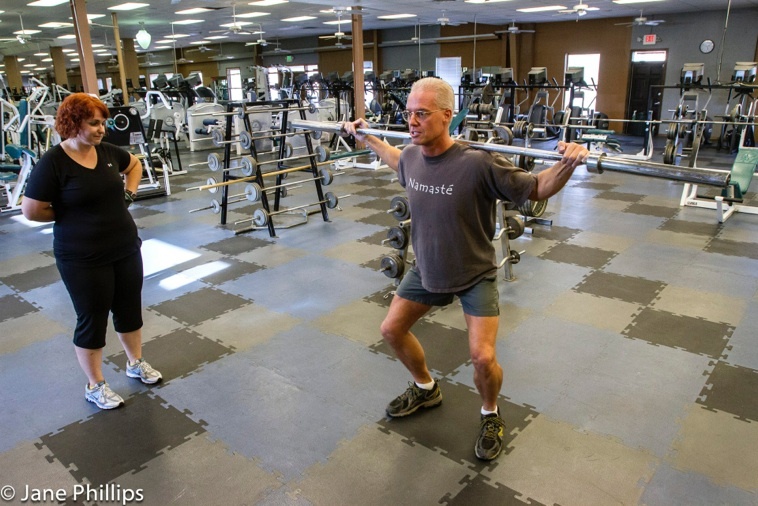 Top of page: Jeff Nailen, Personal Trainer Santa Fe Style, makes fitness fun! 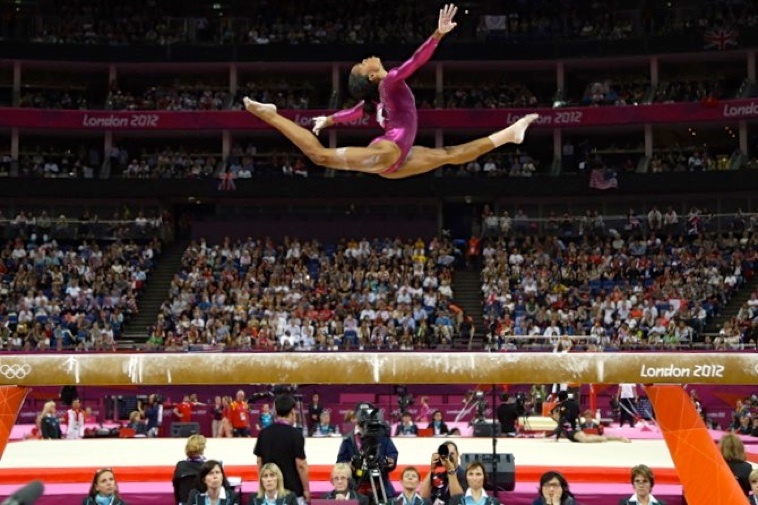 Middle: U.S. Olympic gold medal gymnast Gabrielle Douglas flies into history as the first woman of color of any nationality and the first African-American gymnast in Olympic history to become the Individual All-Around Champion. And with such grace. Way to go girl, you inspire us all. So proud of you. Lower: Santa Fe Personal Trainer Jeff Nailen shows Laura proper form. Along with a healthy diet strength training and aerobic/cardio exercise are essential to healthy sustainable weight loss. Get a Santa Fe personal trainer for the ultimate fast-track to your goals. 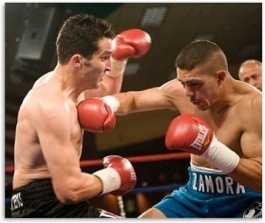 If you live in or near Santa Fe we can train at Santa Fe Spa, your apartment/condo gym, or your home gym. I can help you design and equip a home gym. I’ve designed several home gyms in the Santa Fe area as well as the Zia Vista and Nava Ade gyms. Working with a personal trainer is the royal road to weight loss but you don’t have to be royalty to afford it. Smart intense 30-minute workouts save time and money. Discounts and payment plans are available through PayPal which offers free financing with no interest when you pay in 6 months with the Bill Me Later option: Get in shape now and get 6 months to pay for it without interest. for their health rather than merely mending the machine. There’s a trend in dog training called positive training promoted by the Humane Society which emphasizes positive reinforcement and encouraging praise over harsher methods of training. It’s similar to the tendency in humanistic psychology, positive psychology, and positive adult development to view human beings as essentially healthy and encouraging them to actualize their full potential. This trend in dog training has occurred simultaneously with a militant trend in fitness training towards ‘boot camps’ and ‘drill sergeant’ old-school trainers as seen on TV who tear people down and shame them into healthier behavior through criticism and yelling – a short-term ‘shock and awe’ strategy using fear, guilt, and intimidation. This is tarnishing the image of personal training. isn’t it good enough for people too? While some do indeed respond to this type of treatment, it’s not for everyone. There are more humanistic, more humane ways to motivate. Traditional old-school approaches create negative associations: diet and exercise become associated with self-deprivation and punishment, hardly things people want to adopt as long-term lifestyle habits! A healthy lifestyle is actually quite pleasant and the more pleasant you make it the more permanent it can be. Positive experiences are sustainable over time, while negative experiences can only be endured temporarily – better to flow with our nature than to fight it: harness the ‘pleasure principle’ in the service of your goals. There are any number of reasons for the militaristic trend in fitness training, among them the militarization of the Bush years and the modern medical military model which reacts to the obesity epidemic with a militant attitude within an allopathic frame as if obesity is a communicable disease caused by germs rather than a degenerative disease caused by underlying lifestyle behavior: ‘combating’ ‘fighting’ ‘battling’ or ‘killing’ obesity through patient ‘compliance’ to doctor’s ‘orders’ and medically ‘approved’ ‘protocols’ within a hierarchical authoritarian relationship. These influences predate reality TV which is a reflection of these underlying worldviews that have existed for centuries asserting themselves in physical culture as art imitates life: the culture wars playing out in physical culture. This is near and dear to my heart. When I hear about a PE coach humiliating a student, a physician scolding a patient, or a drill sergeant fitness trainer yelling at a client, I wonder how this encourages people to enjoy being active as well as what the founders of personal training like Jack LaLanne and Joe Weider would think of such tactics (both living well into their 90’s, in contrast to an average life expectancy for physicians of 59, and for the general public of 74, according to data compiled by Ancestry.com from the Social Security Death Index). A Doctor of Chiropractic, Jack LaLanne was a product of holistic living. Joe Weider, through his fitness magazines and contests, tirelessly reminded fitness revolutionaries of our cultural debt to classical Greek humanism without a hint of militarism. An important aspect of finding the best trainer for you is to find one whose worldview and values match your own so you’re speaking the same language. Which worldview are they grounded in? From which epistemology do they see and interpret reality? From which enactment paradigm do they operate on the reality that they see? Do they operate out of a Biblical-era traditional religious paradigm, an Enlightenment-era modern medical/scientific mechanistic empirical paradigm based on classical Newtonian physics, a 20th century postmodern holistic systems biopsychosocial paradigm based on evolutionary biology and postmodern epistemology, or a 21st century integral paradigm that honors them all? Do they see the body as the temple of the Lord to be honored with clean living religiously, as a machine to be measured and fixed scientifically, as part and parcel of a complex adaptive system to be optimized holistically, or some sort of synthesis or integration of these interpretations that gives due respect to each? Do they define health as the absence of sinful living, the absence of overt disease symptoms, as positive fully functional flourishing, or as an integration of these dimensions of health? Since real lasting change occurs from the inside-out, you have to start with the ghost in the machine: Choose a trainer who shares the same worldview so you’re speaking the same language and enacting the same paradigm in the service of your goals. Personal Training Santa Fe Style™ trains body & mind: the whole person. Lose weight with a positive trainer in your journey to a better life: to a fit bodymind worthy of your potential. You’re the designer of your destiny and I’m a positive personal trainer who can help you get there faster and safer. Why don’t we make training a pleasant experience so you will want to adopt the behaviors necessary to lose weight in a healthy way as conscious practices that can be habituated into the automatic habits of your new healthy lifestyle? 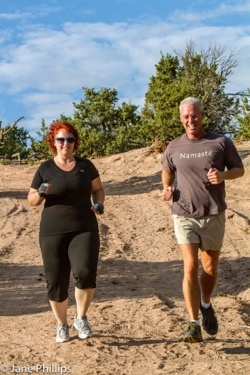 As you would expect from a Santa Fe style approach to weight management, the Santa Fe Way is natural, healthy, holistic, casual, fun, fulfilling, and sustainable. The journey or way is as important as the destination if you don't want to crash on your way there. Journey and destination are inextricably bound, you can’t have one without the other: they’re two aspects of traveling. So if you want to reach your weight loss destination then make the journey sustainable. The best way to make it sustainable is to make it enjoyable. in the matter of physical training . . . If you, like me, are not motivated by the traditional militaristic ‘boot camp’ drill sergeant approach, nor by the conventional scientific materialism of the aging allopathic modern medical military model, you have a clear alternative: a postmodern humanistic holistic positive approach to personal training, a reaffirmation of the physical culture of classical Greek humanism that spawned the noble Olympic movement, a healthy nonviolent alternative to militant combat that channels competitive energy into civil sportsmanship and inspiring athleticism. The American fitness revolution, an outgrowth of postmodern Humanistic Psychology and the Human Potential Movement, is a renaissance of classical Greek humanism. Integral Yoga and the Integral Movement build upon this by adding holistic health and personal growth practices East & West such as yoga, the martial arts, and meditation for yet broader wellness and deeper wholeness. “Jeff brings wit, humor and broad intelligence to a workout. He is encouraging and supportive. He prescribed a food plan, (not a diet) that is working for me; and I have lost 12 pounds in 8 weeks. I have another 10 to go and am confident I can achieve it. I recently had a stent procedure that went without a hitch (no pun intended) to which I attest the conditioning Jeff helped me with for the past few months. I signed up for a year and it was/is a good decision. Pinon Ranch Land & Water Co. Positive Personal Training is about working with a supportive trainer who inspires you, not a drill sergeant who yells at you. Your positive alternative to boot camps and drill sergeants. “When I started working with Jeff I weighed 225 lbs. Today I weigh 190 lbs, reflecting 35 pounds of weight loss. What’s compelling is that I lost that weight while increasing muscle mass, so I’ve likely lost somewhere between 40 and 45 lbs of body fat. “Before I started working with Jeff I was pre-diabetic, clinically obese, and hypertensive. My cholesterol and triglyceride levels were off the chart. I was a heart attack or stroke patient waiting to happen. I was also dealing with issues related to stress and anxiety. “All of these conditions, to date, have been remediated. This was accomplished without the use of drugs, dangerous chemicals or hormones of any sort. “Since I started training with Jeff, I have lost 35 pounds. But that is the least important accomplishment! My strength on practically every exercise has nearly doubled. I have gone from not being able to do a push-up to being able to knock out twenty. I recently played my brother in tennis and he was shocked that I was serving harder than I ever had before. When you get a whole lot stronger, lots of things get better. “My waist is six inches smaller, my neck is two inches smaller, and my muscle tone has changed from flabby to solid. My confidence about my appearance is much improved. My entire outlook on life has become more positive. “You might imagine that such results required spending all day in the gym. Jeff is very knowledgeable about the state of the art on how to get optimal results. His program for me consisted of two workouts per week and each workout was UNDER 45 MINUTES LONG! Lose weight sustainably by enjoying the journey. How do you lose weight and get in shape the smart way? Welcome to a new fitness paradigm of balanced growth. Fitness Santa Fe Style™ promotes balance across complementary capacities or components of fitness: strength, stamina, mobility, and flexibility, for balanced physical development of the body. It also encourages natural growth by gradual progression over time through beginning, intermediate, and advanced stages of development within each fitness component approaching training systems appropriate to each developmental stage with Beginner’s Mind, an attitude of eagerness, open-mindedness, and lack of preconceptions as a beginner would approach new learnings. What’s the safest most effective way to train? What’s the best fitness training system? The matrix below shows where the main fitness training systems fall along the major dimensions of Fitness Santa Fe Style™. The horizontal dimension represents balance across fitness components and the vertical dimension growth or progress within them. Pilates, P90X, and CrossFit are examples of partial integrations of some of the systems and stages, especially on the left side of the matrix, into larger metasystems. 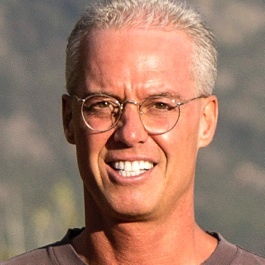 From a systems perspective you are a complex adaptive system (CAS), a term coined in Santa Fe by the founders of the Santa Fe Institute (SFI), the world’s leading center for studying complex adaptive systems. Your interrelated subsystems can be categorized in any number of ways: physically and mentally, structurally and functionally, quantitatively and qualitatively, etc., and any combination thereof. Regarding functioning or performance, fitness components or capacities, likewise, can be classified in any number of ways, and indeed there are several taxonomies out there with no consensus among them. The compound bodymind has two major aspects or dimensions, body and mind: the exterior objective physical body in the world of the terribly obvious that can be seen, and the interior subjective consciousness that is aware of the body as an object of consciousness, the subject who is seeing. Structural body composition and the health of component body systems, sometimes called ‘health-related components of fitness’ are dimensions of structural ‘health’ rather than functional ‘fitness’ per se, the combination of which are the components of ‘health & fitness’ broadly speaking, whereas the focus here is on functional fitness. The temporal dimension arrays the ‘stages,’ ‘grades,’ or ‘levels’ within each of these lines of physical development into general beginning, intermediate, and advanced stages of development. Progress through these developmental stages forms the vertical Yang dimension of the matrix. Milo of Croton was a sixth century BC wrestler who was determined to make himself the strongest wrestler in all of Greece. 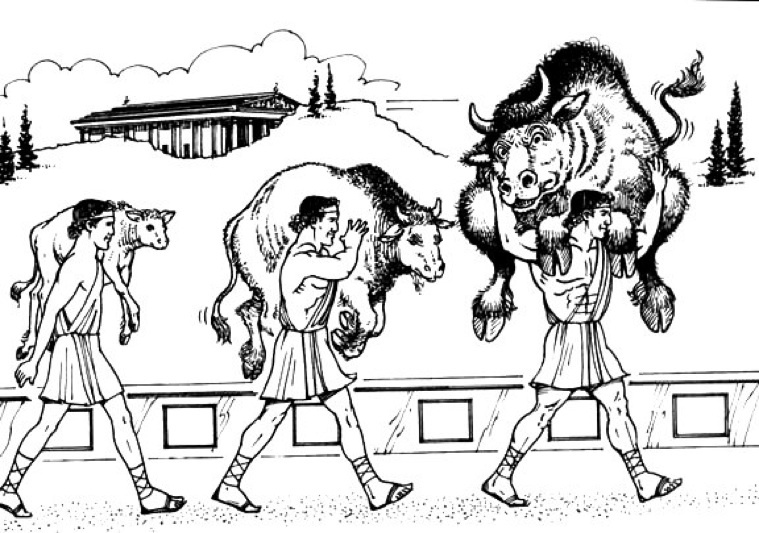 One day early in his career he decided to lift and carry a newborn ox and walk around a stadium bearing the extra weight. Milo would repeat this exercise every day and as the calf grew heavier Milo grew stronger until he eventually carried a full-grown bull across his broad shoulders. By this time he was widely acknowledged as the strongest man in the Western world. For 24 years he was an undefeated wrestler and the champion at six consecutive Olympics. 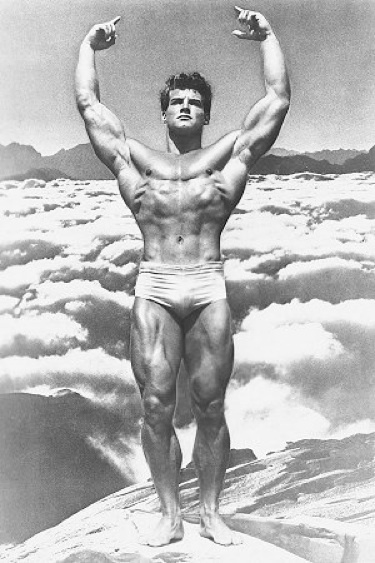 Milo’s strength-building system was a crude form of what we now call progressive overload or progressive resistance exercise: a gradual increase in exercise intensity and/or duration over time to elicit desired adaptive responses in the body, building functional capacity like strength and endurance and corresponding structural integrity in muscle and bone mass, the structural adaptations to functional demands. Form follows function: the body adapts to the exercise you give it. Exercise builds muscle mass and bone mass, molding the body. The more muscle and bone you build the more fat you burn, even while sleeping – once lean tissue is built it has to be maintained. Muscle is the most metabolically active body tissue burning more calories than any other. Building muscle helps you burn fat and then keep it off. referring to muscular hypertrophy and atrophy. 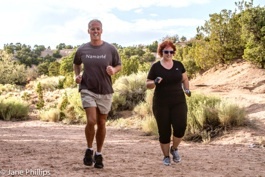 One of the main benefits of Fitness Santa Fe Style™ is the recognition, often forgotten in fitness fads, that a person’s fitness needs are relative to their current fitness level, age, goals, and preferences. It provides context: there’s a place at the fitness table, so to speak, for every training system and metasystem according to its contributions and limitations. It includes the contributions of each while excluding only their advocates’ claims to absoluteness as being the best training system for everyone all the time. There are zealous advocates of High Intensity Training (HIT), High Intensity Interval Training (HIIT), Pilates, Bikram Yoga, P90X, CrossFit, Kettlebell Training, Functional Training, etc., who tend to believe their system is best, some of whom believing everyone should use their system regardless of fitness level, needs, goals, age, or without gradual progression. This results in unnecessary injuries. Line absolutism is the fallacy whereby one line, method, or system of training is believed to be the only real or important or true training system to the exclusion of others which are deemed wrong, bad, or false. Absolutism results in denying, dismissing, excluding other aspects of fitness training so is therefore faulty thinking from the perspective of inclusive network logic and systems holism. From an evolutionary epistemology perspective each of these training systems is valuable to some people some of the time or they would have been selected out of existence. Each deserves due consideration and integration into a larger framework that honors the contributions and limitations of each. Which is the best training system? All of the above. 1)Honor their contributions: Adopt an open mind about each of them. 2)Honor their limitations: Adopt healthy skepticism about their claims. 3)Try stage-appropriate fitness systems according to your needs, level of fitness, and goals. 4)Trust your body’s feedback and your intuition while trying them. 5)Use gradual progression within each system and among systems. What’s the difference between fitness training and personal training? Although they’re sometimes used interchangeably, technically fitness training, sometimes called physical fitness training when the emphasis is on the physical aspect of the bodymind, is what you do when you workout, exercise, or train for fitness on your own — and you can get great results when you know what you’re doing. However, just as a piano teacher or voice coach can help you develop your musical talents faster and more effectively than trying to figure it out on your own, working with a professional personal trainer can take your health and fitness to a higher level of results faster, safer, and more effectively. We motivate clients by providing goals, feedback, and positive accountability. Proper exercise prescription by a trainer results in improved body composition, physical performance, heart condition, and health outcomes1. Moreover, personal training has been shown to exercise behavior patterns, improve the benefit-to-concern ratio for exercise (decisional balance), and increase confidence in choosing fitness instead of other time demands (scheduling self-efficacy)2. Personal training results in higher strength, higher workout intensity, and higher perceived exertion during exercise3. People working with personal trainers use heavier loads than those who don’t, one reason for better results. But the main reason is that you work smarter.